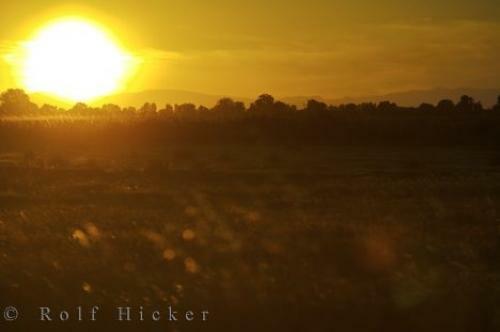 Like a ball of fire, the sun sits near the horizon during sunset in the beautiful Camargue region of France in Europe. Sunset over Parc Naturel Regional de Camargue, Plaine de la Camargue, Camargue, Les Bouches du Rhone, Provence, France, Europe. Parc Naturel Regional de Camargue in France.